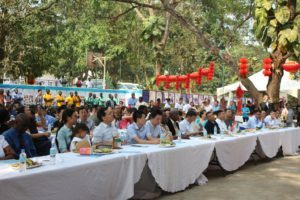 Chinese Ambassador to Sierra Leone, Wu Peng, has disclosed that over one thousand four hundred (1,400) Sierra Leoneans last year acquired training in various discipline in China. Ambassador Wu Peng was yesterday speaking during the Spring Festival Serial Cultural Experiencing Activities of Confucius Institute, Fourah Bay College (FBC) campus. He also disclosed that one thousand three hundred (1,300) of that number were people from all walks of life that acquired training through Chinese government sponsorship. “100 of that same figure were students who embarked on a journey to study in China through Chinese government scholarship programme. In October 2018, 18 college students from the University of Sierra Leone (USL) were awarded with Chinese Ambassador scholarship. This scholarship is an annual programme for outstanding performances in studies as well as their knowledge in China and China-Sierra Leone bilateral relationship,” the Ambassador said. He pledged Chinese government’s close cooperation with its Sierra Leonean counterpart in building the human capacity. 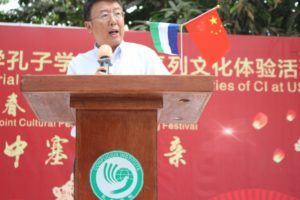 Ambassador Wu Peng said this year’s Chinese Spring Festival would mark his second term since his arrival in Sierra Leone. Representing the Vice Chancellor and Principal (VC&P) of USL, Winston Webber, said the Chinese Spring Festival is observed worldwide with lot of cultural activities. “For us in Sierra Leone, it is an opportunity to know what it is all about, experience the beauty and richness of the Chinese culture and to use the experience to further strengthen our mutual relationship with the people of China,” he said. He said USL considered the celebration as not just a show of the Chinese culture, but also as an important aspect of extra curricula activities, necessary for learning and understanding cultural diversity. “Sierra Leone and China have long history of diplomatic relationship, and we have benefited so much especially in the areas of education, infrastructural development, technical support, investment and trade, etc.,” he said. Prof. He Mingqing, Director of Confucius Institute (CI) at USL, said in the past six years, CI has set up courses at different levels, including Chinese major at the undergraduate levels of the university and Chinese credit courses. He disclosed that CI has established 14 teaching sites, covering pre-school, elementary school, secondary school, vocational and university levels, with students coming not just from schools, but communities and enterprises as well. He said in 2018, the number of registered students of CI reached five thousand (5,000). “One of the institute’s accomplishments is the founding of ‘The Voice of China’, a Chinese language radio channel that has 10,000 audiences at each show and 50 shows each year,” he stated. Prof. Mingqing said the institute has organised innovative cultural events, such as high-end international conferences, academic seminars and medical lectures, adding that they have also set up a Taichi garden as a landmark symbol for martial arts and Taichi at the institute. “The institute for the first time organised the well-received Job Fair for domestic and international enterprises in Sierra Leone, providing 3,500 positions for the graduates at the university,” he said.